This children's song about the naming of John the Baptist was written by American evangelical-turned-Roman Catholic Christian children's songwriter and performer Robert C (Rob) Evans (b 1953) - aka "The Donut Man". It is inspired by Luke 1:59-66. It was and first published in 1987 by Integrity's Hosanna! Music. Today it is included in Evan's Songbook 1, which can be purchased through his website. It's not clear if this includes sheet music, or just the words. Used copies are sometimes available through Amazon - but the book is cheap enough that buying new and direct from Evans is recommended. A snip from a professional recording can be heard on the composer's website. 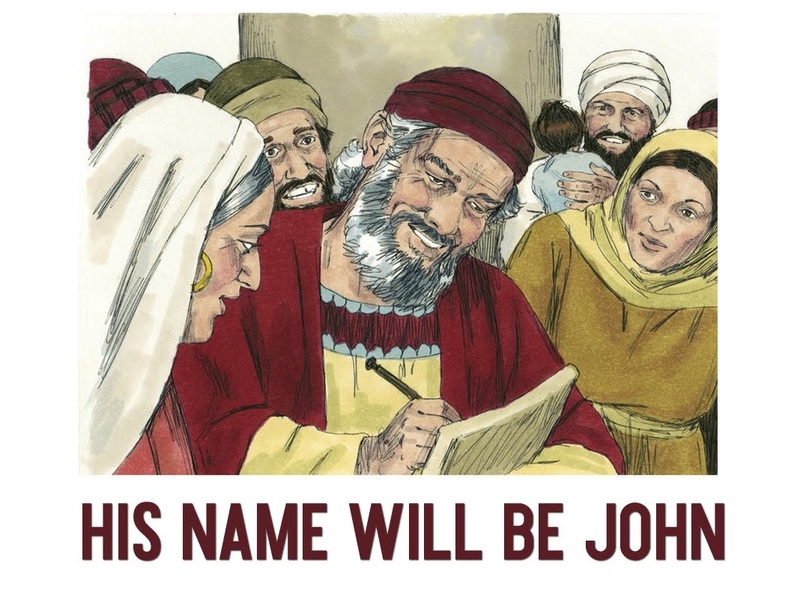 Tell us, Zechariah, what name will you give your son? Will his name be Ron? Will his name be Tom? Will his name be Jim? Will has name by Tim? Then tell us, please, what name you’ll give to him. His name will be John, with camel skin on. He’ll point the way to the Lamb of God. No, it won’t be Ron; it won’t be Tom; his name is to be John! Tell us, Zechariah, what name will you give your son? John!